The World Health Organisation says snakebites kill 47,000 people a year in India, which is home to over 270 species of which 60 are venomous. Bengaluru: India is one of five countries that together account for 70 per cent of the world’s snakebite deaths, a study published in the medical journal BMJ has stated, highlighting several lacunae in the treatment of a condition that kills tens of thousands of Indians every year. In India, snakebites kill around 47,000 people per year, according to the World Health Organisation (WHO). And alarming as the number is, it may still be an underestimate, considering that snakebite is a poor man’s burden, primarily affecting the barefoot farmer tending his fields, and often goes unreported. According to the BMJ study, 97 per cent of India’s snakebite deaths occur in rural India. India’s snakebite crisis is perpetuated by the fact that formal health care is either inaccessible or inadequate in rural areas. It doesn’t help that the Indian antivenom has been devised on a one-size-fits-all model that is leaving many patients without the help they need. As many as 54 lakh people are bitten by snakes, venomous or not, around the world every year, according to the WHO. Unless brought to medical attention immediately, a venomous snake’s bite can kill people. “Bites by venomous snakes can cause severe paralysis that may prevent breathing; bleeding disorders that can lead to fatal haemorrhage; irreversible kidney failure; and severe local tissue destruction that can cause permanent disability and may result in limb amputation,” says the WHO. Antivenom, prepared from snake venom, is the only specific treatment for snakebites, which made a comeback on the WHO list of neglected tropical diseases after four years in 2017, a tag that may bring more research funds. These preparations, the WHO says, are included in its list of essential medicines and should be part of any primary healthcare package where snakebites occur. Antivenom is typically known to work when it has been derived from the same species that caused the bite, though solutions for unidentified snakes are slowly finding their way into circulation. Therein lies the most basic problem with the process of antivenom manufacture in India. Antivenom in the country is derived from the venom of the ‘Big Four’ snake species — common cobra, Russell’s viper, saw-scaled viper and common krait — which are responsible for as many as 90 per cent of local snakebite deaths. This is termed ‘polyvalent’ antivenom and is effective only against bites from the four species. But India is said to be home to over 270 snake species, 60 of which are venomous. “Monocled cobras are widely spread across the northeastern states but they are not one among the Big Four,” said Jose Louise, a member of the conservation body Wildlife Trust of India. “The subspecies of saw-scaled vipers found in western India is different from that found in other parts of India. And the venom composition of kraits is the most complicated because they largely differ [depending on their location],” he added. “In all such cases, the antivenom we currently use will not work,” he said. As Louise pointed out, even among the “Big Four”, there are variations within the species based on their location, even within short distances. Snake venom is a cocktail of a wide variety of proteins, including hemotoxins, which affect the blood or blood vessels, and neurotoxins, which impact the brain and nervous system. Geographical variation in venom composition can, thus, have grave implications for the clinical treatment of bite victims. Experts say the disparity in the sourcing of antivenom, which may render it ineffective, remains unaddressed. “The big problem is that most of the venom used for the production of antivenom comes from one district in Tamil Nadu,” said Sunagar of IISc. Most of the major antivenom manufacturers in India source venom from the Irula Snake Catchers’ Industrial Cooperative Society in Tamil Nadu, an initiative of the forest-dwelling Irulas who are known to be expert snake catchers. Sunagar and his team at the Evolutionary Venomics Lab are currently analysing venom from “medically important snakes”, including, but not restricted to, the ‘Big Four’, across the Indian subcontinent to improve the quality and efficacy of antivenom. “Our initial research suggests that there is plenty of venom variability between populations of the same species depending on geographical location,” said Sunagar. “So, antivenom produced largely by sourcing venom from one location cannot neutralise effects of venomous snakebites from across India,” he added. Another big problem is access to proper treatment within the right time. “Not many [primary healthcare] centres have sufficient antivenom stocks,” said Siju Abraham, an assistant professor in the department of emergency medicine, Jubilee Mission Medical College and Research Institute, Kerala. This costs patients crucial hours. “Between 4.5 and six hours is when most symptoms of envenomation would begin to manifest,” Abraham said. But this time-frame is a bit of a stretch as well, he added, stating that immediate medical attention was most important. Snakebite treatment is also expensive. 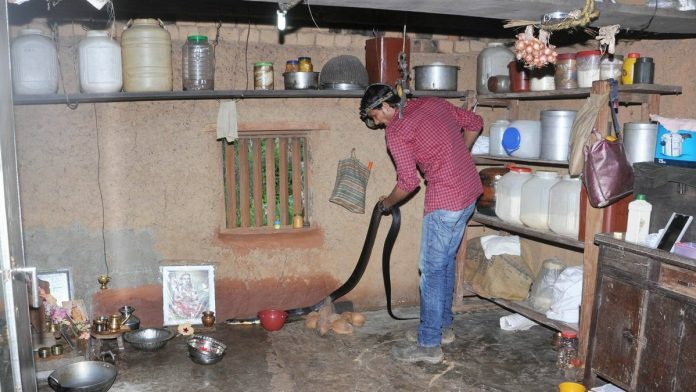 “One vial of antivenom costs about Rs 1,000 and, in most cases, snakebite victims are treated with at least 10 vials,” said Abraham. The ancillary hospitalisation charges are an added burden, especially given the financial standing of the demographic most vulnerable to snakebites. Abraham also sought to point out another concern, the fact that many primary healthcare workers are not aware of crucial techniques that can buy patients time. “In the case of neurotoxic venom, ventilation is very important,” said Abraham. “And if a simple bag-and-mask ventilation is provided to the victim in the time that he is referred to the right healthcare facility, it could possibly save his life. But not many centres are aware of this,” he added. Such basic methods of airway management, he said, were lacking in most primary healthcare centres. Abraham then drew a parallel between India and Australia, which only had between one and four snakebite-related deaths between 2005 and 2015, despite being home to some of the world’s deadliest snakes. “The stark difference is noteworthy because Australia has far greater numbers of venomous snakes than India,” he added. In India, activists say, snakebites remain a largely neglected area. Some states offer compensation to the relatives of people killed by snakebites, but there have been calls from activists for government intervention on the treatment side. They have reportedly sought the identification of snakebites as a notifiable disease on a par with HIV/AIDS and swine flu, to ensure the healthcare mechanism kicks in effectively to prevent and treat snakebites.